I often get called out for "mom-ing" people who are not my children. As in full grown adults. I guess I just like to take care of people who are important to me and make sure they feel loved and secure. Or I'm super controlling and can't help myself. I choose to think the former. When our super, amazing, magical, wonderful, part of our family, nanny announced she was moving to a new apartment I knew I wanted to put together a special house warming gift for her. Moving can be daunting and it takes awhile for a new place to feel like home. I wanted to make sure my gift helped set her up in her new place and make it just a little more "homey." 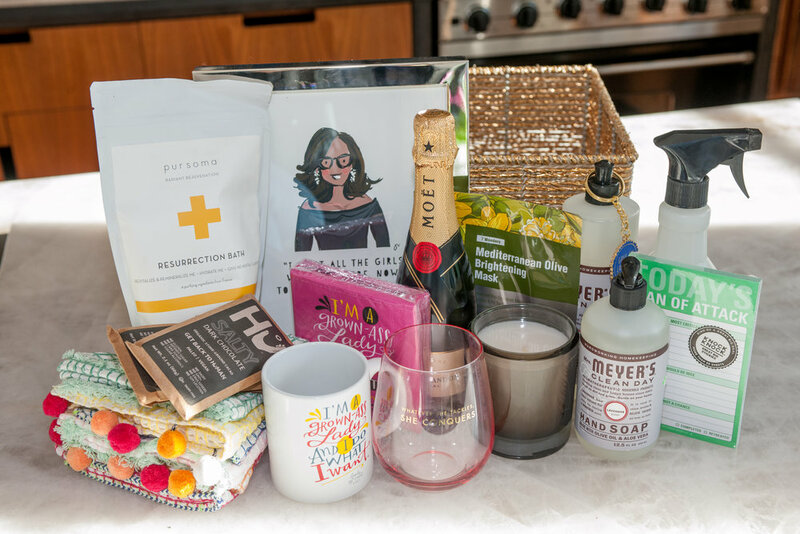 I put together a basket of new apartment essentials and indulgences for her and I am so happy with the result! I packed all of the goodies in this pretty basket that she could use for storage once she opened her gift. a mini bottle of champagne to toast to her new home!